One of the hallmarks of curricular approaches to student learning outside the classroom is that learning is scaffolded and sequenced to follow a student’s journey through their time in college. After educators identify their learning objectives (cascading from Educational Priority, to Learning Goals, Narratives, Rubrics, and Outcomes), the next step in the process is to map out objectives and sequence them to allow for cumulative learning. Rather than being a lock-step process, mapping and sequencing learning objectives allows curricular planners the ability to test their objectives and identify gaps in learning. This is a dynamic process that can involve feedback loops whereby one may wish to revise learning objectives in a reciprocal process. 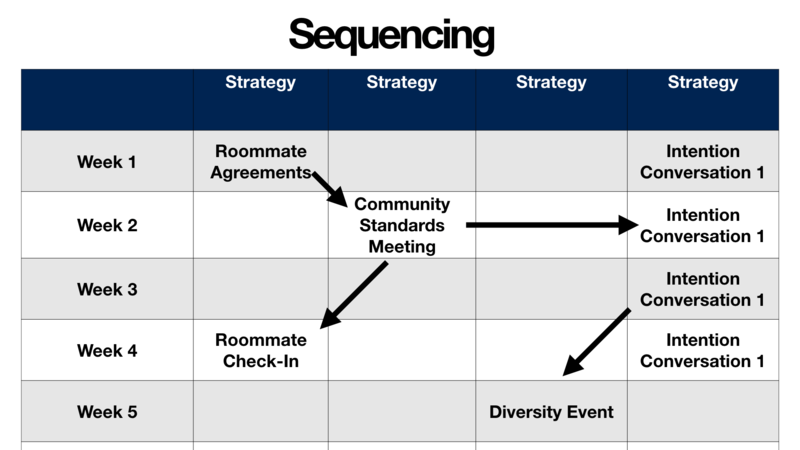 The planning process for sequencing student learning over the course of their time in residence or on campus is a dynamic one. Starting with an end goal in mind, often one’s Educational Priority, and working backwards is one strategy. Starting with where students are likely to begin the process of their learning and development upon entering college working forward is another. Realistically, however, this is a reciprocal process. As one begins planning, one may find that that their educational priority is too ambitious, or conversely, not ambitious enough. Likewise, the pacing of learning and development may seem too fast or too slow. Planning and sequencing learning towards the achievement of an overall end requires one to constantly renegotiate and adjust to reach an optimal level of challenge and support. Adding a layer of complexity is knowing that however well planned something is, learning and development are messy processes and each individual that goes through a curriculum is unique. Strategies and programs should allow for customized learning unique to each student’s journey. Mapping student learning objectives allows one to make connections between specific outcomes and activities or strategies through which these outcomes can be learned. Begin by creating a table where your learning outcomes are listed in one column. Then, in subsequent columns, list the individual strategies and learning opportunities you provide. Place X’s in the areas where these overlap. 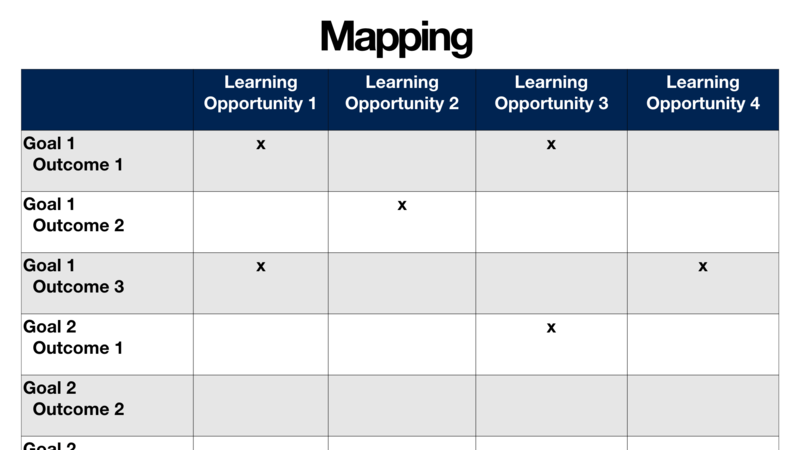 By mapping your learning objectives in this way, you may notice that you place too much emphasis or not enough emphasis on a particular objective. You can also repeat this process with variables other than your learning opportunities such as a student’s class year or departmental offerings across campus. The mapping process is less about creating a concrete end product and more about what you learn in the process of developing it and from your analysis of it. Another stage in this process is sequencing one’s learning objectives. In order to reach towards more complex learning, different stages in the learning process must be identified and built upon. For example, if I am learning to effectively work through conflict, I likely first need to understand what my own perspectives are and what my conflict management style is. After doing this self reflective work, I will need to understand how various conflict styles interact. Finally, I will need to know and be able to apply strategies for mitigating conflict and reaching towards resolution. In order to be effective educators, the learning process we map out from month-to-month and year-to-year should help guide students through successive stages of learning. Of course, not all sequencing processes are clean. There may be certain events at your university that occur at specific times of year. You may need to account for this by starting with the outcomes of that event and working around it. You might provide opportunities to help prepare students for the event or to process it and continue learning afterwards. This is also true of key dates in the semester, such as course registration, or internship and study abroad deadlines. When beginning your sequencing process, you may wish to start with a calendar that includes known key dates already identified and build around them. Of course, this process does not occur in a vacuum. You should also be mindful of staff (and student) time to ensure that learning opportunities are evenly spaced out throughout your calendar. Despite your best efforts with sequencing, it is probable that a student may miss a stage or they may be starting college at a point more advanced (or prior to) your learning objectives. To accommodate this, repeat learning objectives through different strategies. I might attempt to teach students about conflict style by developing a bulletin board, reiterating and applying this information through a guided roommate agreement process, and then asking a staff member to follow up with a student in a one-on-one conversation. Repeating learning objectives through multiple strategies ensures that students have a more consistent experience. Other strategies for addressing consistency include developing incentive systems for student participation. The University of Dayton Department of Housing and Residence Life awards students points for participation in activities which helps determine their place in the housing selection lottery for the next year. Since participation in these activities is always voluntary, it is important to help students understand the potential benefits and why they may wish to participate. Mapping and sequencing learning objectives and opportunities is helpful in scaffolding your learning process over time. As one of the final steps in developing an overall educational plan, these processes allow one an opportunity to provide coherence to a curriculum and help students learn important information and skills at the appropriate times when they are ready for and need them. Rather than thinking of mapping and sequencing as a finite process, approach it as an opportunity for curriculum review. Revisit these maps and sequences as necessary to enhance your curriculum over time. What types of variables would be most helpful to you in mapping your curriculum? What key events and dates are set in your calendar? How can you sequence learning around these? Are your learning objectives appropriately aligned and reasonable to achieve? How can you include mapping and sequencing activities into your curricular review processes?